Stanley glues guns are perfect for everything from arts and crafts projects to general repairs around the house. With Stanley glue guns, there's no longer a need for separate guns for hot melt and dual-temp glue. These guns accept both types of glue and work just as efficiently with either. Heavy duty glue guns are hard to come by in the tool industry, and Stanley has addressed this issue by creating a well designed, comfortable line of glue guns. 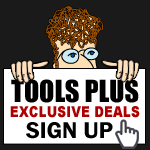 Tools-Plus offers a variety of Stanley glue guns along with the hot melt and dual-temp glue sticks that work with them.